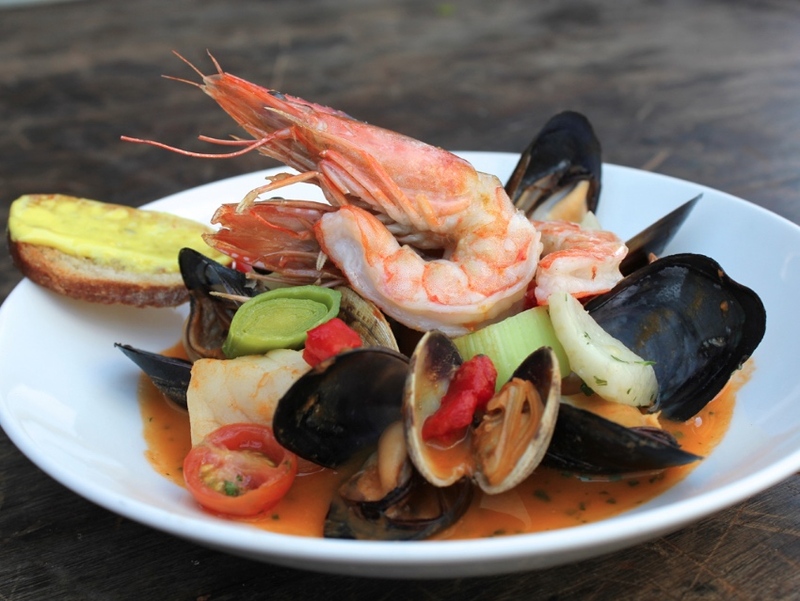 Bouillabaise is on Church & State's Throwback Menu this weekend. All this week, Church & State is going back to a simpler time to celebrate its seventh birthday. Chef Tony Esnault is recreating the French bistro’s original 2008 menu, including crispy pig ears with béarnaise sauce, salt cod with fingerling potato gaufrettes, and bouillabaisse. The real kicker is that the prices are a throwback, too—everything costs what it did seven years ago (inflation moves quickly!). They’ve also got a new fall cocktail menu worth exploring. Church & State Throwback Menu is available this week until Friday November 6. The restaurant is located at 1850 Industrial St., (213) 405-1434. You’ll probably want a reservation. Some of the city’s biggest names in food will come out Friday to benefit the James Beard Foundation. It’s not a cheap ticket, but if you’re game, the event includes a tasting reception with bites from Ray Garcia, Timothy Hollingsworth, Michael Hung, Jessica Koslow, and Zach Pollack. That’s followed by a four-course dinner from Hugh Acheson, Jon Shook, Vinnie Dotolo, and Louis Pechan. James Beard Presents: Taste of Los Angeles will take place this Friday, November 6 at The Ebell of Los Angeles, 741 South Lucerne Blvd. Tickets are still available. $100-$350. Is there a downside to our current obsession with healthiness and moderation? That’s the question that this “Open Art” event hosted by Zócalo Public Square will examine. KCRW’s Evan Kleiman will moderate a panel scheduled to include Gluttony author Francine Prose, UCLA medieval historian Teo Ruiz, and chef Eric Greenspan, all of whom will be considering the cultural importance of feasting and what it offers us emotionally. You can consider this a companion piece to the Getty’s The Edible Monument and Eat, Drink, and Be Merry: Food in the Middle Ages and Renaissance—the fascinating exhibit opened last month and will continue until January. Can Gluttony Be a Virtue? will take place Wednesday, November 11 at Redondo Beach Historic Library 309 Esplanade, Redondo Beach. Entrance is free, but reservations, which can be made here, are required. Allagash is turning ten, and they’re celebrating at Downtown’s Little Bear. A special “Friendsgiving” dinner will be offered—you don’t have to buy tickets, you just show up and order. Rare brettanomyces (a type of yeast that gives sours and lambics their signature tang) fermented beers from Allagash, like Little Brett and Confluence, will be poured. Allagash Friendsgiving Dinner takes place on November 19, starting at 7:00 p.m. at Little Bear, 1855 Industrial St. No tickets necessary. ‘Tis the season for one of nature’s most luxurious gifts: the white truffle. Chefs, especially those in Beverly Hills, aren’t wasting any time, and there are plenty of places to indulge. There’s the 5-course White Truffle Tasting Dinner ($110) from chef Mette Williams on at Beverly Hills’ Culina on Friday, November 20, which includes diver scallops with sweet potato. The White Truffle Series, a ($350) 16-course dinner menu, at SAAM at The Bazaar by José Andrés, is offered every Friday-Saturday until November 21. At Wally’s Beverly Hills, there’s a Farmers Market white truffle tasting on Saturday, November 7 from 10:00 a.m. to 1:00 p.m. Free samples of dishes from chef Executive Chef David Féau will be available and paired with $1 tastings of Burgundy and Piedmont wines. Also, don’t forget that To Live and Dine in L.A. ends November 15. Last call!